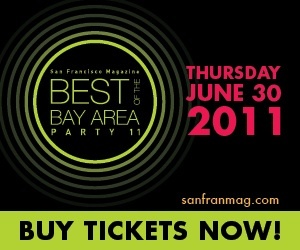 VIP Tickets to San Francisco magazine’s Best of the Bay Area Party! All the best come to party at San Francisco magazine’s 11th annual Best of the Bay Area Party—the City’s biggest bash of the year. Celebrate the best of the best with more than 45 restaurants (think: Bar Agricole, Plate Shop, Chotto, and 25 Lusk), free-flowing bars, the Sonoma Valley wine lounge (with names like Scribe Winery, Gloria Ferrer, and Audelssa), and the hottest sounds of the city (Party Ben, People at Parties DJ La Fleur, and DJL!). Style up and get down with 2,000 of your closest friends. VIPs start the party early and go home with a digital swag bag stocked with the city’s best-kept secrets. And everyone goes home happy knowing their best night ever supported one of the best causes around–Family House. VIP: 6—11 p.m.; Main Event: 7—11 p.m.